The first person you have to lead is yourself. Sounds obvious; but that can be one of the hardest things to do! Its crucial though … if your obedience is too far behind your knowledge you develop a lack of inner confidence that leaks out into your leadership. It shows. So how do you get a grip on yourself and do what you should? You have to find quiet solitude to give yourself space to listen to God and think deeply, uninterrupted. About the only time you can find this is early in the morning. Most leaders that manage themselves well book off significant time early in the day for this important reflective activity. Rule #1: no social media or email during this time! If I just take even a quick peek I get hooked into something interesting or urgent … and my reflective time with God is gone. Start my day with God, before anything else distracts. A nice hot cup of coffee gets me ready to enjoy this time. I use two-way journaling as a way to pay attention, to listen, and to dialogue with God. This has become a precious record of God’s working in my life. This is the time to read Scripture leisurely, savoring each word, soaking in it by the chapter. This is not sermon prep time; its intensely personal. I use a colored pencil system to highlight important phrases; my pen makes notes and underlines. Messages can come out of this later, but its not the purpose of these morning times. Its also the time to delve into good spiritual reading. I benefit reading what other people have discovered in their walk with God. All this takes a couple of hours. It fills my cup so I can draw from it for the rest of the day. I really notice it when I skip this morning time. But you may say, “I’m not a morning person! 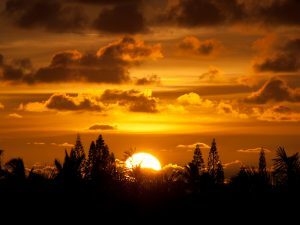 I come alive in the evening.” Well, here’s good news – the Hebrew day begins at sundown! This pattern was set at the creation of the world, when Scripture says, “evening and morning was the first day.” Fascinating that the biblical day starts with resting; then you live from its abundance. So different from dropping exhausted into bed at the end of a day. If you are an evening person, the day starts in the evening. Enjoy your time of solitude then. Actually, evenings are important for morning people as well. A good morning starts with a restful evening the day before. So if you need more rest, sleep in on the front end of the day – i.e. go to bed earlier. I find if I try to work late in the evening I am exhausted the next morning. My day was ruined by the evening before. So I have a personal rule: no work after 9 p.m. Meetings need to end by then; no email or voicemail. Mute the phone. I head to bed and scan the news headlines so I am not clued out what’s going on; but no heavy reading. I take out a good, relaxing novel and read just for the fun of it to get my mind off the burdens of the day. When I’m sleepy, I turn over, shut off the light, and end my day with thanksgiving prayer. In no time flat, I am asleep. So … what works for you? When do you get your alone time? What do you do in your quiet time?